Dual Electric Fan wiring and fuse kit. Includes relay, relay sockets, ample wiring, in-line fuse holder & fuses, and instructions. Toggle switch or temperature sender to activate fans is required. Dual Electric Fan thermostat, wiring and fuse kit. Includes relay, relay sockets, ample wiring, in-line fuse holder & fuses, and instructions. Includes temperature sender to activate fans at 180 degrees and turn them off at 160 degrees. Eletric Fan Relay Harness SPAL. 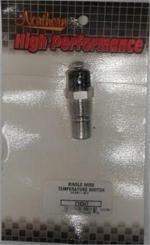 Includes relay, relay plug with ample wiring, in-line fuse holder & fuse and fan pig tail lead. Temperature sender is not included. Electric Fan Switch used to ground fan relay at 185 degree coolant temperature. Electric Fan Switch used to ground fan relay at 195 degree coolant temperature. Electric Fan Switch And Harness Assembly SPAL. Includes relay, relay plug with ample wiring, in-line fuse holder & fuse, fan pig tail lead and temperature sender. 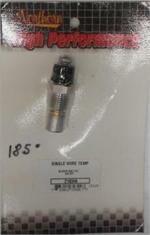 Electric Fan Temperature Switch 185 Degrees SPAL. This switch is used to ground a fan relay and engage an electric fan at the preset temperature of 185 degrees. Eletric Fan Temperature Switch 195 Degrees SPAL. This switch is used to ground a fan relay and engage an electric fan at the preset temperature of 195 degrees. Single Electric Fan thermostat, wiring and fuse kit. Includes relay, relay socket, ample wiring, in-line fuse holder & fuse, and instructions. Includes temperature sender to activate fan at 180 degrees and turn it off at 160 degrees. Aluminum Fan Spacer 2" thick. Has a 3/4" hub pilot. Includes four 5/16" fine thread bolts. Will fit some Ford and Corvette applications. Use of the correct size fan spacer will allow proper positioning of the belt driven fan blade. 100% Made in the USA. Aluminum Fan Spacer 1" thick. Has a 5/8" hub pilot. Includes four 5/16" coarse thread bolts. Will fit most Chrysler applications. Use of the correct size fan spacer will allow proper positioning of the belt driven fan blade. Aluminum Fan Spacer 1/2" thick. Has a 5/8" hub pilot. Includes four 5/16" coarse thread bolts. Will fit most Chrysler applications. Use of the correct size fan spacer will allow proper positioning of the belt driven fan blade. 100% Made in the USA. This kit allows you to mount a transmission or engine oil cooler or an electric cooling fan to the core of a radiator or A/C condenser. Includes 4 each nylon bolts,washers,push-nuts and rubber spacers. Set of four Steel and Plastic Electric Fan Mounting Straps. This is the recommended way to mount an electric fan. Steel strap swivels to provide endless mounting positions. Each measures 7 1/4" long. Cap-A-Radiator from Teena Nawabi on Vimeo.